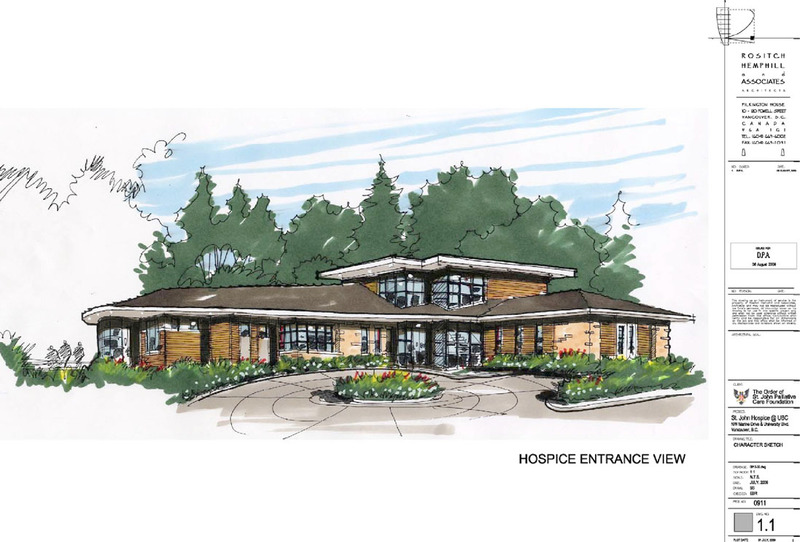 Last September, in partnership with the Vancouver Hospice Society, the Order of St. John and Vancouver Coastal Health, the Board of Governors passed a partial Board 1 to build a hospice. 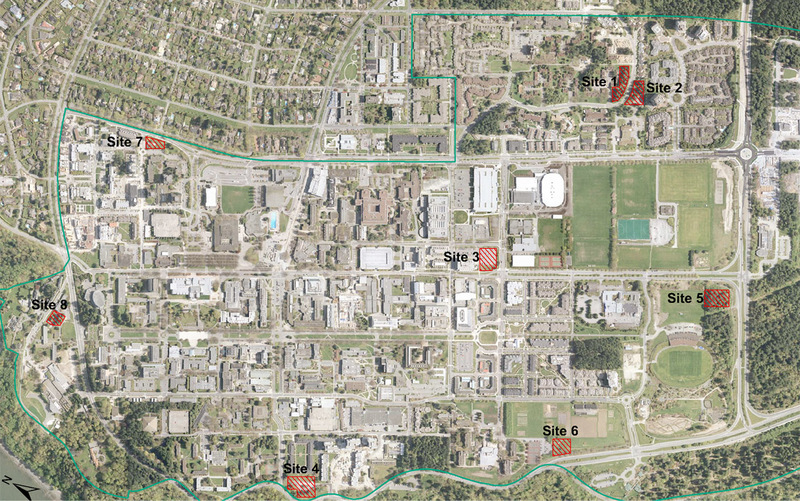 The building will only cost UBC marginal maintenance costs, the management will be undertaken by VCH, and the building is forfeited to UBC in at least fifty years. A good deal for all parties. The Board approved the plan, and sent the planning department off to come up with a site and to contract out the design. 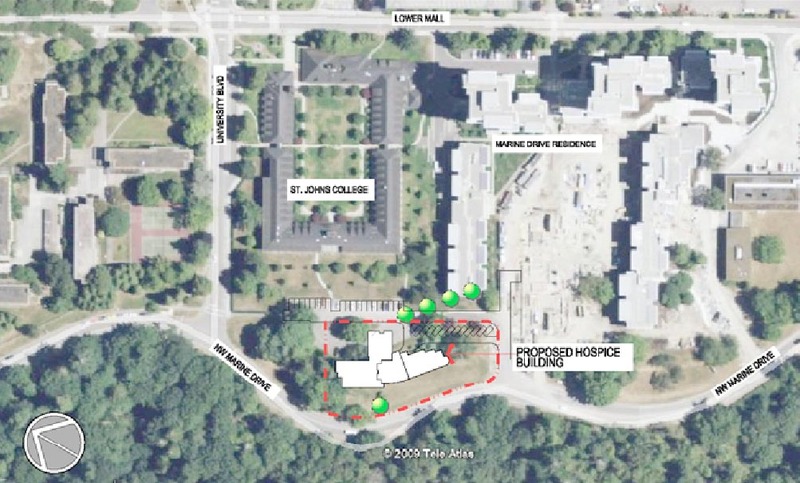 Wanting to give the Planning Department guidance, the Board resolution charges that the site is to be “compatible with adjacent usages” since “campus life is probably somewhat more boisterous than that typically associated with the tranquil environment of a hospice”. Under that guidance, Planning came up with eight possible sites. Because of future planning considerations and an aversion of amending the Official Community Plan, Planning went with Site 4, just west of St. John’s College, south of Trail 6 to Wreck Beach, and sandwiched between Place Vanier and Marine Drive student residences. One of the less “boisterous” locations on campus to be sure. When faced with the question of contracting out the design, the Order of St. John, who presumably consulted extensively with Planning, went with Bryce Rositch‘s architectural firm, Rositch Hemphill & Associates Architects. Bryce served as chairman of the UBC Board’s Property and Planning Committee from at least 2006 until last year. I assume UBC’s fair, independent contracting process considered all the dozens of Vancouver architectural firms on level-footing, and that the interests of the University were put ahead of contracting to a friend. The lack of transparency in such a process, given the result, undercuts at least my confidence that UBC is using my money prudently though, regardless of the facts. The proposed site and design then went to the President’s Property and Planning Advisory Committee. PPPAC is a committee composed mostly of appointed administrators that has taken over much of the role and authority of the Senate’s mostly-elected Academic Building Needs Committee. Students on this committee are the AMS VP Academic/University Affairs, as well as two student senators. It survived. One of the last stages of the consultation process is the public open house. If you can find out about it, that is (good luck). About ten members of the public attended the open house, each in opposition to the proposed site. Those opposed mostly came from St. John’s College, who have been having a lively discussion about this proposal over their internal mailing list. The Director of St. John’s College, a prominent Chinese historian, was steaming as he felt he has been shut out of the process, and has been unable to voice his opposition to those with actual authority. Other parties opposed to the site include the Wreck Beach Preservation Society, who oppose almost everything, and the ten-to-twenty students I’ve spoken to who are actually aware of what’s going on. When asked for comment, the managing director of housing did not respond, though the director of planning said he supported the site location. 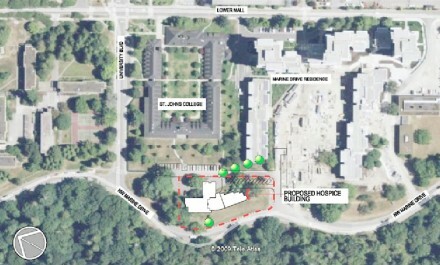 Provided all goes according to plan, final Board 1 approval is scheduled for this September the 17th, and then St. John’s College, Marine Drive and Vanier will have the terminally ill as neighbours. Maybe having 4,000 or so undergraduates in the full throws of life isn’t such a bad thing for those on their way out? If anything, the residual marijuana smoke will ease the pain a little. Oh how I miss this sort of stuff. Wait. Its kind of sad to think that when, one day, I pay a visit to UBC, its likely that every walking train, garden, lawn, park, tree, path, etc, that I ever enjoyed walking through, or on, or by, will be gone. Instead there will be some random shining glass/wood building decrying how wonderful and diverse the university is. Maybe they can stick something along Main Mall too. I do believe that the grass space in the middle could fit a nice elongated sort-of admin building or Starbucks or some other profit-making entity. Or maybe a 4-story parking-lot. Great article Alex, I’m really excited for Insiders this year. I am not excited for octogenarians near Vanier as their arthritis prohibits them from competing in beerpong. I just cannot understand how isolated and clueless whoever selected the location must be. I actually cannot comprehend how a sober, reasonable person could think this would benefit students, the residents of a hospice (they wouldn’t appreciate being woken up, and they would be), or the university’s image since it’s bad for both. Epic, and I mean epic, fail. The location they were kicking around for this two years ago was at the north end of the Botanical Gardens’ parking lot. It would have been difficult for anyone to complain about that. It’s also not clear to me how, if this really is connected to UBC’s research mission, the OCP enters into it. @F. Hydrant: That’s concerned me as well. I need to crack open the OCP again, but C&CP seems to be convinced that the old site would require an OCP amendment. Perhaps they spoke with Metro Vancouver and Metro said it needs one? The board resolution was pretty clear that the Botanical Gardens was the intended site, provided OCP stuff could be cleared. So I’m not totally sure why this is so upsetting. It seems like this plan doesn’t actually harm students. In fact, the only people it seems to potentially cause problems for is the terminally ill who will be living on campus, and I’m sure that was something that was considered. I don’t see any problem with having terminally ill people as neighbours. In fact, I thin it would be hugely beneficial to students to have people unlike themselves on campus. Having students work with them and learn that UBC is not simply an institution for students would, I think, be hugely beneficial. I think a problem arises when it seems likely to assume that severe noise restrictions will be imposed on Vanier as a result of the Hospice. These noise restrictions would be both unenforceable and incredibly detrimental to the non classroom life of first year students. Also just at a philosophical level, I have no problem with filling an important health service demand and potentially generating revenue, but I think that you always have to do a cost benefit analysis weighing these benefits against the detriment to students who are (at least in theory) at the very core of the UBC strategic plans. Also, an additional cost in the cost benefit analysis is that this location will probably significantly reduce the quality of life of the seniors in the hospice, as even if the people in Vanier try to be sensitive to the hospice, they are after all first year university students, and they won’t (and shouldn’t have to) hugely restrain themselves throughout the year. Good to see that other Chinese are separating themselves from the comments that Janet Fan and the other condo owners have made. (1) UBC is supposed to be focused on education. However, it has been involved in disgraceful real estate deals with developers to market high end housing (the kind that Ms. Fan lives in) on endowment land which was supposed to be used for higher ed. Like the whole of the Lower Mainland, UBC is well on its way to becoming an environmentsl disaster. The province should have investigated UBC’s real estate activities long ago. (2) UBC’s primary purpose has been to provide university education for B.C. students. Yet, like many in Canada’s politically correct herd of independent thinkers, its current President Stephen Toope has recently stated an alternative : “Diversity is a key to (students’) future well-being.” “Diversity” promoters are causing many problems. In November, Toope went on a trip to India with 14 other university presidents to recruit foreign students. Supposedly, one of the purposes of this visit was to bring additional revenue to UBC and other universities. However, the former President of the Council of Ontario Universities and former head of Trent University has stated that foreign student tuition fees “are not money-makers”. The result of Toope’s (and predecessors’ activities) is that UBC now has a student body that is well over 50% Asian and well on the way to becoming a mono-culture. How much “diversity” is in a mono-culture? No one objects to people of Asian background who were born here becoming students at UBC. But most would object to importing students from Asia for highly questionable economic reasons. Most would like to know what percentage of UBC’s students are foreign students who have been brought here with the intent of profiting from their presence. Ms. Fan’s comments show some of the effects of elevating “Diversity” to the status of a national goal for Canada. Most Canadians would like to know what effects Toope’s (and other university presidents’) moves for “Diversity” are having on Canadian students of both mainstream and Asian background. Toope and his colleagues should know that many students could not find summer jobs in 2010 to support themselves this year. Many have had to take on debt. When these students graduate, many will have to compete with foreign students for employment—thanks to an immigration policy of encouraging foreign students to stay in Canada. As for delaying the building of a hospice to accommodate Chinese sensitivities, UBC should be telling Janet Fan and her fellow condo owners that this is Canada. It is not a colony. If they don’t want to adapt to the culture here, they have a place they can return to. Toope and UBC should develop the backbone to get off their knees and say this and much more publicly. Well said Dan Murray, the people of Hongcouver better have a good look at what is going on around them. UBC wasnt built for the benefit of Foreigners. Taxpayers in Hongcouver should have a good look at who is running institutions like this one.i.e. have SFU , BCIT,Capilano,and others already fallen??? Well that’s pretty racist. Oh internet. What’s “racist”, Alex-do you mean the attitudes of wealthy Hong Kong immigrants? You think racism doesn’t exist among Asians? Think again. Most people are-it’s just white anglo saxon liberals who beat themselves up about it. There is no “religious” history in China, the religions in China today are protestant, catholic and muslim. Bhuddism is not a religion, but it does teach compassion, as does Daoism, and Confuscious etc. There are hospices in China, they are not hidden away, cemetaries are often in the middle of villages. I lived in China for 5 years, and this is about money, nothing else. The Chinese people for the most part have no respect for the elderly, the ill or the disabled, they treat them horribly. The Government is trying to change their attitudes but they have a long fight ahead of them. The problem facing hospices in China is young people refuse to supplement the cost for their parents, they prefer them to die as quickly as possible. There is a lot of prejudice in China against the elderly, the disabled, black people, and foreigners (Cdns) are often spit on by the Chinese, this not a culture we want influencing our Cdn culture. Would their country change to accomodate us, oh hell no. These are not good citizens and not the kind of immigrants we want it Canada. Send them packing – this is Canada, not a province of China, if they dont like our ways they can leave. Just read a comment saying students and residents wont “restrain” themselves towards attitude towards hospice residents and shouldnt have to. I would like to remind you this CANADA and not China and people who find they are unable to “restrain” themselves will no doubt finding themselves facing criminal charges because THIS IS CANADA. We dont accept the kind of abuse China dishes out to the elderly and disabled. For those of you too dim witted to “grasp” the concept of benefitting students not all UBC students are enrolled in Business Admin, there are health care course, psychology and other “human science” courses offered. A hospice will provide internship opportunites for these students. Here’s an FYI you will ALL be old someday, you will ALL be dying someday – would you prefer to do it the Chinese way, as decreed by wealthy selfish greedy inhumane people or the Canadian way, with quality care and compassion? Canada encourages and respects multiculturalism. It also encourages respect for others, diversity, tolerance, compassion and other universal human values. 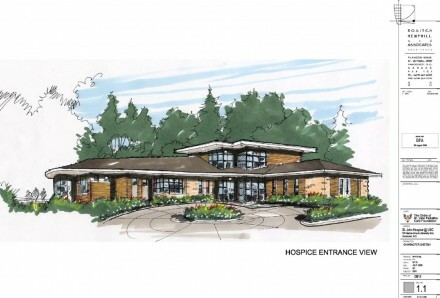 Purpose of an institution like Hospice is to offer and environment respect and compassion to those who need it. For anyone not to understand this basic and common Canadian understanding is probably not in the right place. The door is always open for anyone dissatisfied or cannot understand this simple but very basic human Canadian values.